The blog will soon be renamed to “What Cassie Eats for Lunch”. 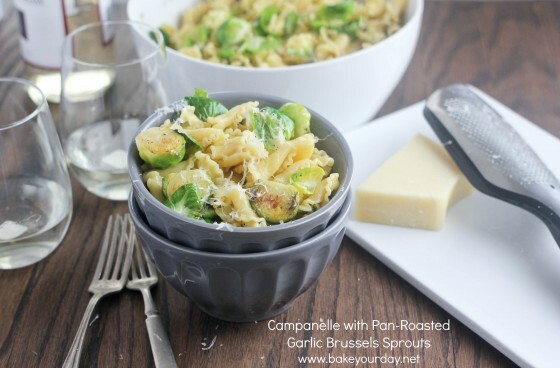 Today’s edition – Campenelle with Pan-Roasted Brussels Sprouts. I’m only partly kidding. I just can’t seem to get anything else photographed these days. Seriously. While most of my friends are posting date-night dinners and fun Valentine’s Day desserts, I am posting the simplest of pasta meals ever. Hopefully I’ll have some dessert for you later this week! Because I’m still trying to get things hung on our new walls, taking daytime naps, doing laundry, washing a million dishes, etc., I choose simple, simple lunches. And you know what? I love ’em. It’s fun to raid the pantry and fridge to see what I can come up with! 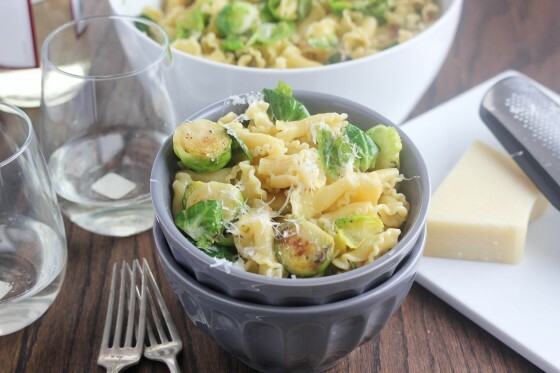 This one – campanelle pasta with garlic Brussels sprouts, pine nuts and parmesan – it’s no different. So, so simple to put together and it’s so flavorful! I could live on pasta and I know I’m not alone in that. I’m not really a person who buys spaghetti or elbow macaroni. I like the fun pasta – orecchiette, fusili, and campanelle. These little things are such a fun shape – they catch all of the sauce – and in the case of this dish – the pine nuts and Parmesan. They were perfect to compliment the size of the Brussels sprouts too. Thank you to Laurie, Chung-Ah, Lauren and Ali, SO MUCH, for helping me out while we moved and started to get settled. Annnnd enter to win an amazing Brookside Chocolate Tasting Kit…just in time for Valentine’s Day! A simple weeknight side dish or weekday lunch with campanelle pasta, garlic-oil roasted Brussels sprouts and toasted pine nuts. Cook the pasta in salted water according to the package directions. While the pasta cooks, toast the pine nuts over medium heat until fragrant. Set aside. Heat one tablespoon of olive oil in a large non-stick skillet. Add the garlic and stir constantly until fragrant and golden brown. Remove the garlic from the pan, leaving as much oil in the pan as possible. Add the sprouts in a single layer, cut side down and cook for about 4 minutes, until the cut sides begin to brown. Add salt, pepper and thyme and toss. Cook for an additional 2-3 minutes, until the sprouts are tender and browned evenly. Add the wine and stir. Allow the wine to reduce a bit, add the remaining olive oil, parmesan cheese, reserved garlic, pine nuts and cooked pasta. Stir to coat well. Serve with more Parmesan cheese for garnish. If you don’t like Brussels Sprouts, then try them again! Just kidding – you can sub broccoli, cauliflower or asparagus for the sprouts. Girl, I need easy pasta dishes like this to balance out all the sweets I’ve been seeing everywhere. 😉 Totally drooling and totally making this ASAP! This kind of meal is soooooooo my jam. 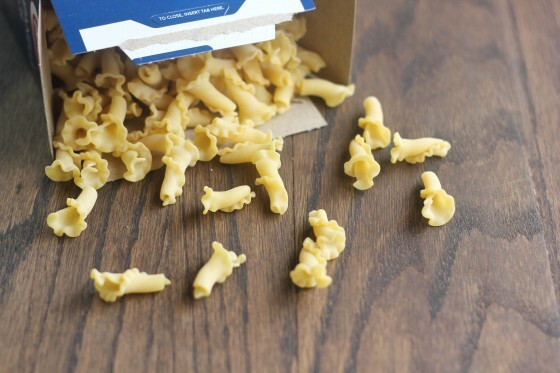 Campenelle is such a fun word and fun-shaped noodle! Also, I never get tired of simple, flavorful lunch ideas. Anything to mix up my turkey sammies and endless line of chili leftovers throughout the week is a winner. Simple pastas are my favorite! I’m sooo digging the brussel sprouts in this. LOVE brussels sprouts, and I just know I’d adore this! Can I come for lunch? 😉 Love this pasta, Cassie! This looks so good! What a great photo – and brussels sprouts have been sort of haunting my brain lately. You may have convinced me to give them another chance! Wow, does this look phenomenal, Cassie! Confession time: I’ve never been a really huge fan of brussels sprouts. But wait! I know I need to eat them, and I’m constantly on the prowl for recipes that make them palatable. This is one of them. Between the pasta and the pine nuts and the cheese, wine, and thyme?!?! Love it. Thank you. Deee-lish!! I love Brussels sprouts, I just have to assume that all the haters have just never had a good version. This pasta will convert a sprouts hater, I’m sure of it. I am always looking for fresh, “light” pasta dishes. This looks amazing! I’m liking your lunches. Love your comment at the end of the recipe about retrying brussel sprouts if you don’t like them. Good thing I love them! all I’ve been posting is desserts! I feel like I should post some entree tomorrow for those people cooking at home. But I love this, and I am not complaining. This is so my kind of lunch, dinner, anytime meal. I want a bowl now!! No worries on the Valentine’s Day posts – simple pasta dishes are needed! I may just make this for dinner tonight! Haha I know how that goes! I love when you post your lunches! They all look so delicious!! I am in love with that pasta too. I dont like to buy “boring” pasta either. Its more fun to eat when they’re fun shaped! I like all the different fun pasta shapes, too. I have a sun-dried tomato salad that I love to use campanelle for…such a pretty pasta for a spring or summer lunch with girlfriends. I love this simple lunch, too – sometimes the simpler, the better! Oooo, what a lovely, LOVELY combination! I’m a huge fan of easy pasta dishes, so keep them coming! 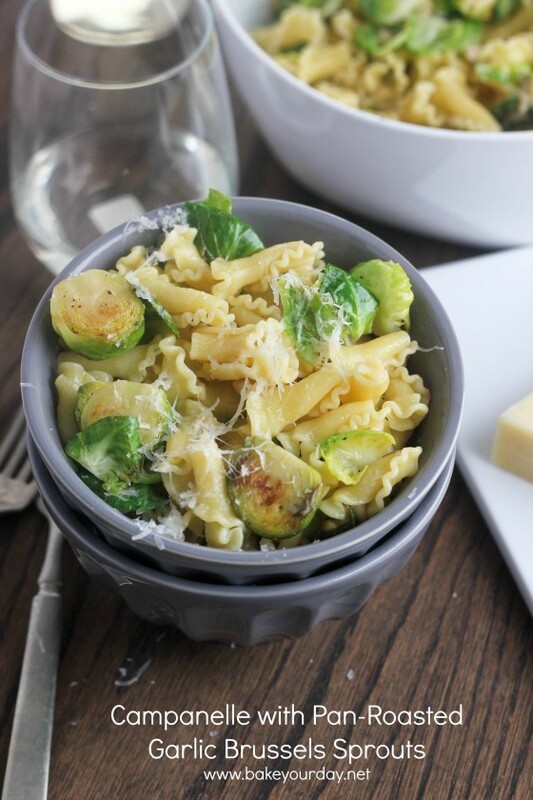 i’m obsessed with all things brussels sprouts and this pasta dish is out of this world!! I’m loving the “what Cassie eats for lunch series”. It makes me miss the days when I was at home for lunch and could create things with whatever we had in the house! This one looks truly delicious! This looks so fantastic! I love trying different kinds of pasta. I’d take this for lunch or dinner any day of the week! I love this dish so much. Brussels are my favorite- paired with pine nuts and parmesan- sounds like a wonderful lunch! Both brussels sprouts and pine nuts are my favourites. I loved the way you presented the dish. YUMMMMY! 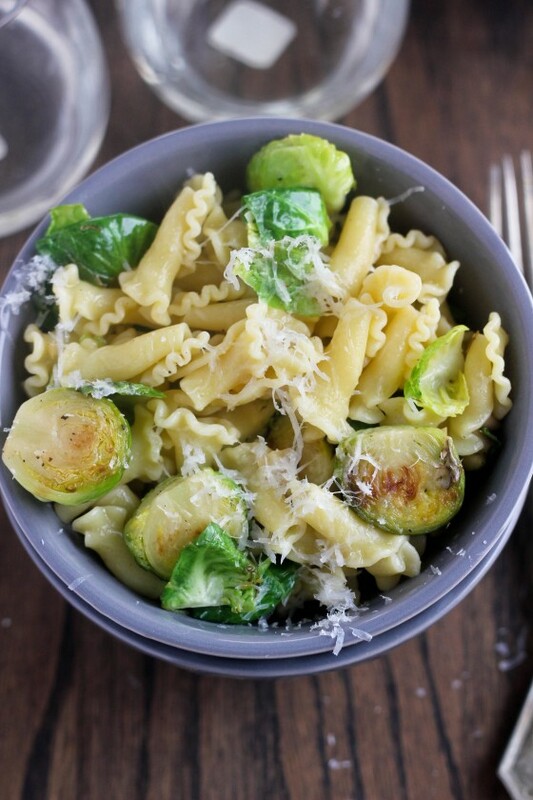 What a great pasta – so quick, easy, and I love Brussels sprouts! This sounds so delicious – it’s such a lovely combination of flavours. I would happily eat this for lunch every day! So beautiful!! I am actually loving brussels sprouts lately…this looks like such comfort food! I would love to eat this for lunch! Campanelle are one of the cutest pasta shapes in my opinion! You have such a great flavor combination going with those brussel sprouts, wine and garlic! this looks so good! what a brilliant lunch! This looks lovely! And I’m all for simple pastas. Much better than something fancy. 🙂 And you find the best pasta shapes! I love Brussels sprouts and pasta! Your lunches look way better than mine. I just made this for dinner tonight and it was amazing! I can’t wait to eat the leftovers tomorrow! I just made this tonight, followed the recipe exactly and it was pretty darn good!!! I haven’t had a pasta dish like this before, it was lovely, nutty, and surprisingly not heavy. This is also the first time I’m cooking brussel sprouts. Thanks for the recipe! I adore brussels sprouts, and in pasta? Perfection.